This year will see big changes coming to my little corner of the world. Not the slow creep of urbanisation which continues to erode our countryside but full on, landscape wide transformation. And all apparently in the name of green energy and saving the planet. I'm surely not the first person to spot the irony in that and to think this was all announced through the most innocuous of deliveries by our postman. 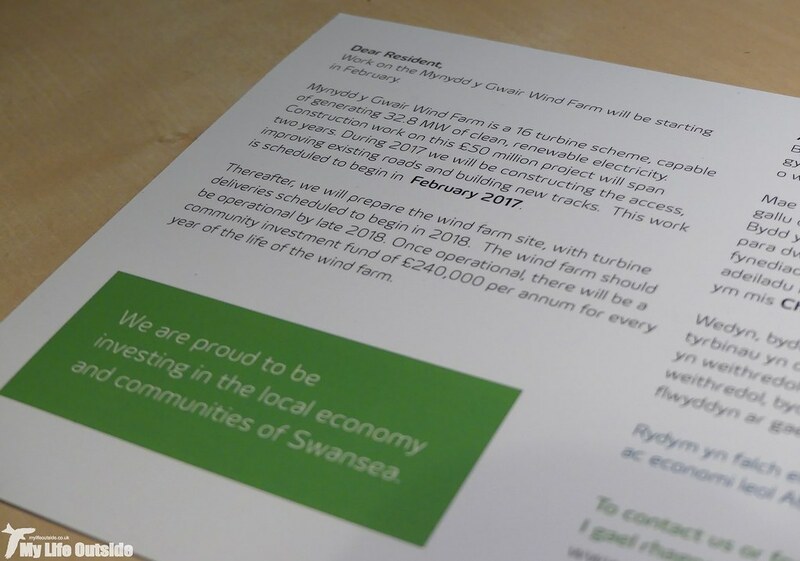 After numerous years of debate, appeals, inquiries and protests the Mynydd y Gwair wind farm has finally been given approval to proceed. This will see the erection of sixteen 127 metre tall turbines on one of the last areas of extensive common land bordering Swansea. Having already lost neighbouring Mynydd y Betws to a similar scheme several years back locals already know what sort of habitat damage to expect and its safe to say that the place will never be the same again. Some will probably wonder at the fuss being raised over what to all intents and purposes is a large area of unimproved grassland, but that fails to recognise the impact and significance of having a location so close to where people live that one can genuinely escape to and see not a single man-made structure. This sense of freedom was one of the very things which drew me to Mynydd y Gwair many years ago and its loss will be felt deeply. Perhaps even more unfortunate is that the impacted landscape stretches far beyond the main wind farm site itself as in order to gain access a 14 km long track will be required. This will stretch from the A48 near Pontarddulais right through the heart of my local birding patch before cutting across Mynydd Garn-Fach and beyond. The full scale of these works is yet to be realised but its safe to say that the character of the place will be changed for ever. It was with that knowledge that we decided to head out a couple of weekends ago to document the proposed route as it is now, before the diggers move in and we lose a landscape which I have fallen in love with over the years. Soppy perhaps but when you've spent so many hours and days walking a place as I have it's hard not to form an emotional bond. At this point I should probably discuss the inevitable counter-argument to my negative slant on the above, the one that states that we must reduce our reliance on fossil fuels and help tackle global warming. Believe me when I say that on both those scores you won't find any grumbles from this blogger. However, I do take issue with those who push onshore wind farms as part of that solution. They've definitely had their part to play as we investigated alternative means of energy production but I genuinely believe that they have run their course. For the energy they generate they are far too intrusive on our landscape when alternatives such as tidal, solar and offshore present a much better compromise. Solar in particular has proliferated locally over the past couple of years yet the sites are almost invisible unless you're directly upon one and have such a light touch (pun intended) that they can be erected and removed leaving virtually no trace. Small scale tidal schemes such as the one being proposed for Swansea also offer great potential as well as providing fantastic new facilities for locals yet seem impossible to get off the ground. 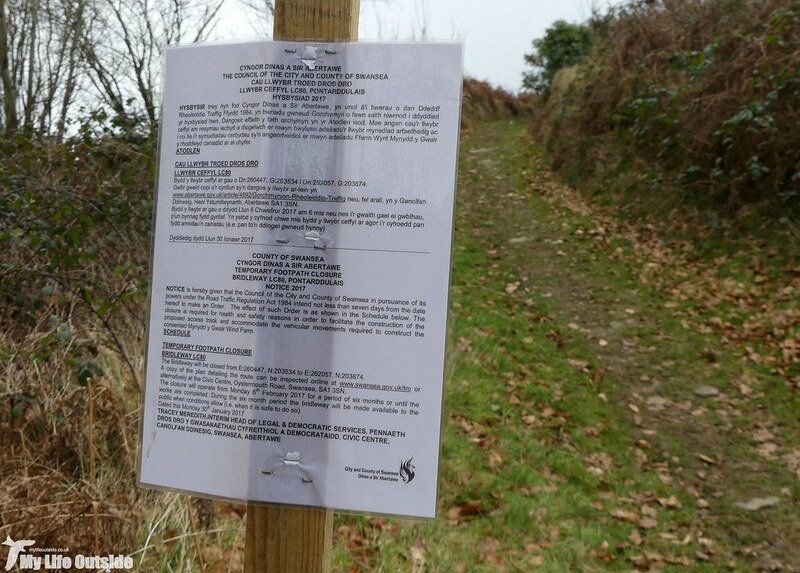 Meanwhile we are happy to grant permission for more of our precious open areas such as Mynydd y Gwair to be sacrificed when recent news reports reveal that similar schemes are being paid by the government not to operate. Yes that's right, tax payers money is being spent to not generate electricity. You couldn't make it up. There are some who will inevitably throw the nimby label in my direction and it's true that I have not written of other such developments across Wales but my views are long held. 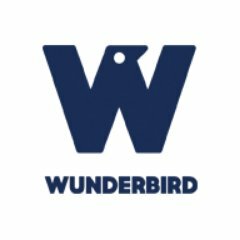 In this case I am merely being presented with a unique opportunity to document and share the full process from start to finish, kicking off with things as they are today. Ideally we'd have had a clear blue sky and sunshine to show off this landscape at its best but what we in fact got was freezing cold, grey and misty, blizzard like conditions. For much of our walk it was snowing fairly heavily, though never enough to settle, and with cloud barely scraping the hilltops it was a miracle we could see anything at all. Still, the following images achieve their purpose admirably and I've annotated each with how things will change over the following two years. This notice greets walkers near the top of Gopa Hill. It states that the footpath ahead will be closed for the next six months, opened to the public only when safe to do so. As the main access point to my local patch this could prove very inconvenient but hopefully the contractors will open it up during the evenings and weekends. The centre of this image shows the point on Gopa Hill where the new track will arrive having cut across private farmland from the A48. To reach this point will involve a steep gradient and I can't deny that seeing the large transporters traversing this will make for an impressive sight. I'd still rather leave the place looking like this though as it's great for breeding Whitethroats. 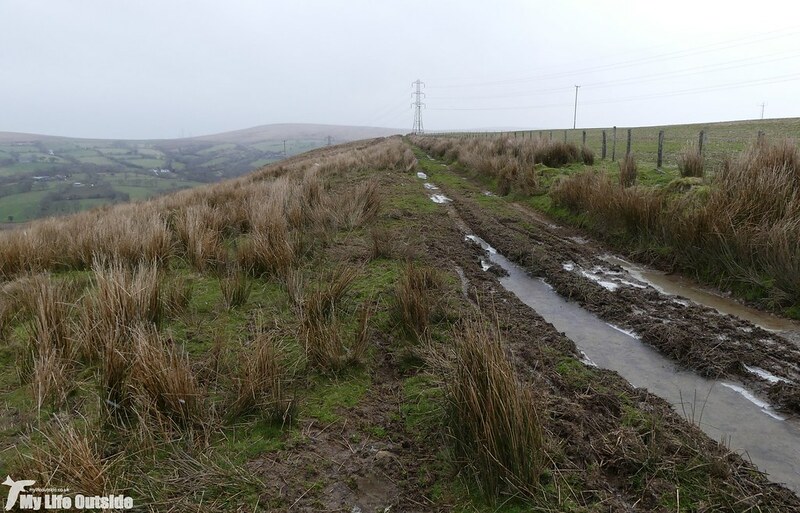 These two images show the existing farm track running from Gopa Hill to Cwm Dulais which will be 'improved' to accommodate wind farm traffic. It's safe to say that its character will be forever changed once widened, regraded and a more permanent surface laid. At Bryn-bach-Common the new track joins an existing minor road which will also need widening, strengthening and regrading. Regular readers may recognise this as part of the area I bird for the Patchwork Challenge but thankfully most of the important habitat will be unaffected by these works. For locals five ways is legendary. 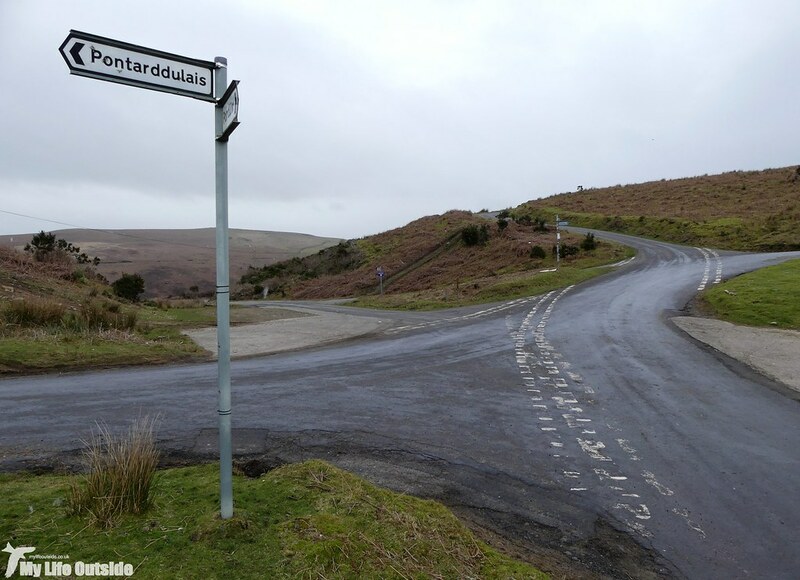 To find such a complex junction out here in the countryside is quite unusual and part of that is down to its importance when the Graig Merthyr colliery was in operation nearby. This section is going to require major remodelling as the descent and rise is simply too severe for a large transporter to negotiate as it stands. I only hope that the character of this place wont be completely lost. 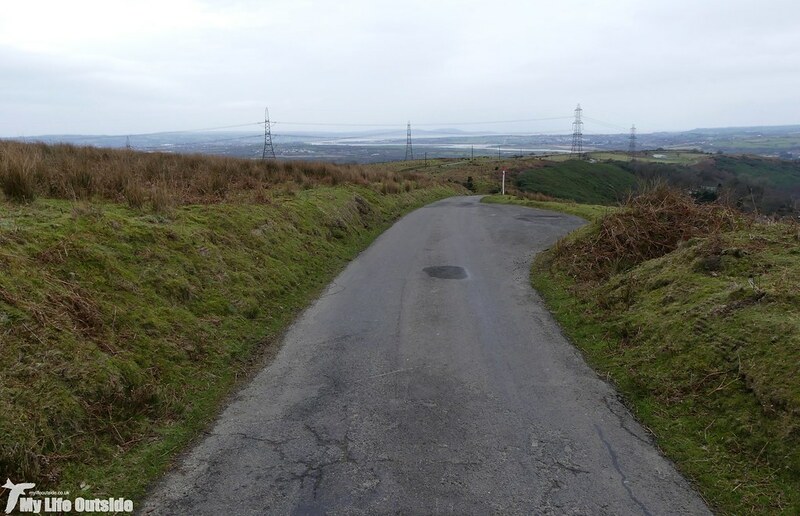 Climbing up to Cwrt-mawr reveals a further stretch of minor road which will need improvement. 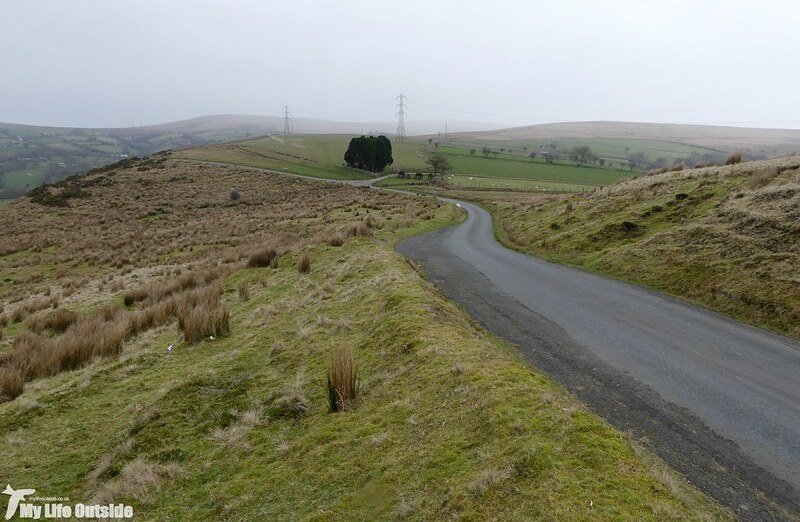 Thankfully Mynydd Pysgodlyn (above) will be spared as the road skirts this area and the fallen trig point which resides there should be safe for many years to come. .....we leave it behind to follow a muddy track which will be significantly upgraded. The access track then follows the contours until Mynydd Garn-Fach, the first significant area of common land which needs to be crossed. Originally there were proposals to site turbines here as well but thankfully those have now been dropped. Even so, having a permanent and substantial track driven through this open landscape will have a major impact. And then we reach Mynydd y Gwair itself. The top image looks down from Mynydd Garn-Fach whilst the second is taken from near the plantation above the Upper Lliw reservoir. The new wind farm covers this area in its entirety and I probably don't need to spell out the changes likely to be wrought here in the next couple of years. Finally we finish at the Upper Lliw reservoir, looking back across the water with Mynydd y Gwair in the background. By 2018 this will be a view held only in memories and photographs. As you can see the area of impact is extensive and it's going to be interesting to see how well the access track in particular blends in with its surroundings. For Mynydd y Gwair though there really is no hope now but I'll be keeping you up to date as the project continues.